Graduates from Oxford and Cambridge hit the frozen fairways to keep the tradition of the "Presidents Putter" alive. 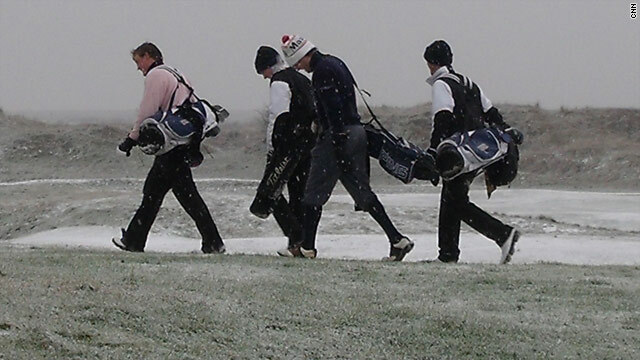 (CNN) -- In a little-known corner of southern England, more than 130 men are wrapping up in their winter warmers and drinking down their last whiskeys, as they prepare to do battle with their fiercest foes on the fairways. Their goal: a place in the fabled history of sporting rivalry between Oxford and Cambridge Universities. The "President's Putter" event takes place every January at Rye Golf Club between alumni of the two famous academic institutions. Competitors, whose ages can range from 18 to 85, travel from such far-off places as the U.S., South Africa and Asia in a quest to attach their winning ball to the fabled President's Putter -- a hickory-shafted instrument dating back to the inaugural event of 1920. David Normoyle flew in from Far Hills, New Jersey last week to see in the New Year with friends before heading down to Rye to take part in the event, which is scheduled to start on Friday. He is just hoping the heavy snowfall forecast for the rest of the week will not cause the competition to be called off for only the second time in its history. "There's a great tradition of the event going forward in spite of the weather," says Normoyle, 31, who studied history at Cambridge. "Last year, there was a hard frost and a very thick fog. There's something lovely about the warmth in the clubhouse at the end of the day when it's freezing cold outside. It really adds to the atmosphere of the whole thing." While the competition is always intense -- many players have scratch or single-figure handicaps -- the matches are played in a jovial spirit and the motto of the event is "serious fun." The winner's medal carries the Latin inscription "Primus inter pares," which is loosely translated by the Putter fraternity as "he was lucky to win." The competition takes place over four days, with a dinner held on the eve of the Sunday final, followed by a night out amid the cobbled streets of the medieval town of Rye. "People push the boat out at both ends of the day," says David Bonsall, Treasurer of the Oxford and Cambridge Golfing Society, which organizes the event. "There are often a few whiskey macs and bloody marys on the first tee to bury the memories of the night before." Entry to the President's Putter is limited to golfing "Blues," the term given to those who play for the Oxford or Cambridge teams at sport. January is the chosen month because if falls at a time when students and graduates are generally on vacation. In its early years, the Putter would be contested by some of the finest players of the day: four of Great Britain's 1926 Walker Cup side were Oxbridge graduates. The record for consecutive appearances is held by World War Two army parachutist Peter Gracey, who played in 57 Putters before finally hanging up his spikes in 2006 at the age 84. Other well-known competitors include the former England cricket captain Ted Dexter, who won the event twice in the 1980s. While the snow flakes continue to fall on the frosty fairways of the course, braver competitors have been out practicing their games. Others have been sharing stories in the warmth of the clubhouse bar as they wait to find out whether their annual pilgrimage has been worthwhile. "It would be a huge disappointment if it didn't happen," says Normoyle. "But we'll make do with whatever the decision is and we'll have fun whatever."